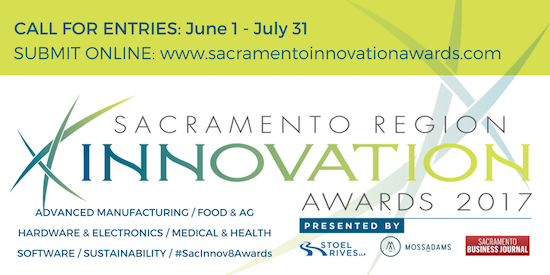 On November 7, 2017 the Sacramento Region Innovation Awards will recognize significant innovations, and the innovators and local companies that brought them to fruition. CMTA is honored to be on the selection committee and was proud to cast a vote last year for the advanced manufacturing category winner Free Form Factory. The 9-county northern California area benefits from world class industry, bringing leading edge research & development, good jobs and economic growth. Advanced Manufacturing: Watercraft Manufacturing by Free Form Factory Inc. — a proprietary technique to manufacture personal watercraft hulls 10 times faster, 3.5 times stronger, and with no volatile organic compounds. Food & Agribusiness: Radio Frequency Pasteurizer by RF Biocidics — a food-safety solution that eliminates harmful contaminants from foods using radio frequency technology. Hardware & Electronics: Linkbot by Barobo, Inc. — a programmable educational robot that can be customized with snap-on parts and STEM curriculum. Medical & Health Technologies & Services: B. infantis by Evolve BioSystems — a microbiome-based solution to establish, restore and maintain a healthy infant gut microbiome. Software: The Risk Number by Riskalyze — a proprietary risk assessment product that measures individual investors’ risk tolerance. Sustainability: FastOx Gasifier by Sierra Energy — waste gasification technology that transforms waste into clean, renewable energy. The program was founded by the law firm of Stoel Rives LLP, which has had similar award programs in Utah and Idaho. The Sacramento Business Journal is the program’s media sponsor and Moss Adams LLP serves as the official CPA vote tabulator. The event will be held at the Hilton Sacramento Arden West in Sacramento.